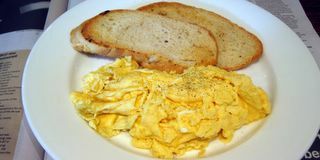 This morning, as I browsed the 2006 Good Food Guide results, I was treated to some very average, boring scrambled eggs and nasty, dry, stale toast. Welcome to l'Osteria Scusami, Southgate, Tel +61 3 9699 4111. But don't worry, you're spoiled for choice, with as many as 6 other dishes to choose from, including toast and fresh fruit. Throw in a winning mix of classic pop-rock blaring on the radio, and the whiff of cleaning-fluid, and you have to wonder why they bother. How to explain my experience this morning at the Montague Park Food Store, Corner Montague and Park Streets, South Melbourne, Tel +61 3 96829680? Maybe I ordered badly? 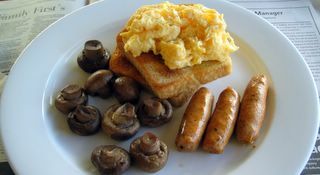 Maybe scrambled eggs with mushrooms is the weak link in an otherwise strong line-up of breakfast offerings? Or maybe it's an ordinary venue, trading off past glory, with a die-hard following of locals blinded by memories of the good old days? I quite enjoyed my hobbit-sized serving of scrambles, which almost covered one piece of toast. I did not, however, enjoy the mushrooms. Who knows how they were cooked, but they looked and tasted as if they'd been boiled or steamed... bland and boring. I didn't eat them. On a more positive note, I did eat the chipolatas (never mind that I ordered bacon, not sausages) and these were pretty good. Even better was the home-made tomato relish, which was thick with squishy strands of onion and had just the right amount of chilli. Arguably the best condiment I've had so far. If I ever manage a repeat visit, two dishes stand out: wattleseed and cashew granola with poached fruit, yoghurt and creamed honey; or "eggs in hell" baked in a spicy tomato sauce with melted cheese and BBQ sauce. Both sound interesting and are supposed to be very good. As always, the Genovese coffee was very good. I particularly liked the way it was served, on a small silver tray with a small glass of water on the side. Nice touch. Service was good too. We decided to take a little road trip today, over the Westgate Bridge and on through the dinky streets of Yarraville. There we stumbled upon Gourmet on Gamon, 84 Gamon Street, Tel +61 3 9396 1916. Serendipity can be a wonderful thing. The scrambled eggs were excellent. And what a fetching plate of eggs it was. Very carefully laid out with a thick square of white toast in the middle, a layer of bacon over that, and small mountain of firm, light scrambles, lightly flecked with snippets of spring onion. I added a side of mushies and a home-made hash brown, neither of which was spectacular, but both of which were good. The poached eggs with spinach (a bit skimpy on the spinach, by the way) were also pretty good, on a toasty slice of Phillipa's bread... the one with all the grains and seeds and stuff. But the hollandaise was a disappointment. It seemed to have jumped straight from the fridge to the eggs, with the all-too-familiar half-solid, half-melting effect that comes with this "technique". If you're going to offer hollandaise, you might was well get it right. Half-arsed hollandaise is only going to get you into trouble. The other menu items to catch my eye were the Cinnamon Pancake Stack, served with mixed berries, vanilla cream and pure Canadian maple syrup; a "light and fluffy" three egg omelette; and a Breakfast Sandwich with bacon, tomato, baby spinach and aged cheddar. The food-store venue has light and spacious feel, with a few dog-friendly outside tables and an open fire in the back room. The coffee was excellent and the service relaxed and friendly. Good value too. Just over $30 bucks for two. 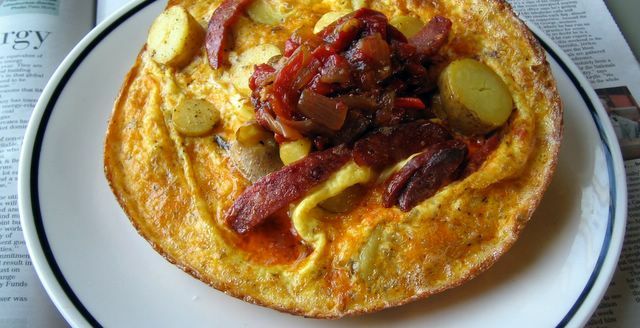 I love a good omelette... Light and delicate with a soft, oozy middle. So you can imagine my disappointment when an Unidentified Fried Object landed in front of me this morning... hard, crisp and dripping with grease. Not a good choice for my first visit to Pelican, 16 Fitzroy Street, St Kilda, Tel +61 3 9525 5847. I must remember to wear my macrame beanie next time I visit North Fitzroy. Maybe a nice brown and green number, made from 100% organic hemp. The perfect outfit for a visit to Tinpot Cafe, 248 St George's Road, Tel +61 3 9481 5312. The highlight of my brekky was an excellent Redlich sausage served with some home-made tomato relish. I really felt like a good banger this morning, and this one hit the spot. 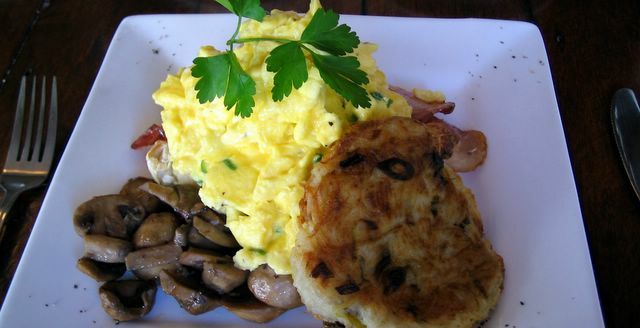 The scrambled eggs and sauteed mushrooms were also very good. So, no complaints from me. There were, however, quite a few complaints from the other side of the table when the "eggs at sea" dropped anchor. The eggs were hard poached. The salmon had jumped ship. And the tide was out on the hollandaise. Despite these glitches, Tinpot seems more likely to serve up a hit than a miss. On top of all the usual egg stuff, the menu includes things like a "Roman Sandwich" of herb toast topped with spinach, mushrooms and parmesan, "Brad's Bacon Bagel Burger" with beetroot amongst other things, and a special of smokey bacon baked beans. Just don't make the mistake of ordering a side of beans, since they will be served fresh from the can. They even do plain old weetbix. Cool. The venue is classic mis-matched retro, and the service, coffee and value are all good. Not quite as good as the Green Grocer across the road, but a good plan B if you're in the area. I do not like green eggs and ham, I do not like them Sam-I-am... Wait a minute. Yes I do. I like 'em a lot. Pesto-scrambled eggs with spinach, avocado, and a nice tender slab of kessler ham. Even the gluten-free toast was pretty good.